Shiro is the autobiographical account of Shiro Kashiba, the “Godfather of Seattle Sushi” who first introduced the cuisine to the Emerald City in 1966. His story is one of passion, that inspirational drive that likens a man to a salmon swimming upstream—tireless, blind to distraction, and staunchly determined to reach his destination. It guides him, from his childhood home in Kyoto to his first apprenticeship in a sushi restaurant in Ginza, and eventually, to Seattle, where he now continues to perform and perfect his trade in his own restaurant. His passion transcends mere desire to practice the honored tradition of Edomae sushi—a tradition whose authenticity he strives to preserve despite America’s penchant for fusion rolls and sauces than are anything but canon—and, indeed, finds its footing in the very earth that lavishes the bounty of ingredients he handpicks to make his exquisite, culinary triumphs. An avid hiker and environmentalist, Shiro is perhaps concerned less about the food than he is in urging people to treasure and protect our natural resources, particularly Puget Sound in the Pacific Northwest. While the narrative and style do not always do Shiro’s experiences justice (he is a renowned chef, after all, and not a writer), they do give a concise and linear account of Shiro’s life, and an overview of the challenges he faced every step of the way. With simple language, a humble tone, and a professional’s knowledge and insight, Shiro holds his reader’s attention throughout the book, leading them at a surprisingly brisk pace. This pace, while gratifying in its ability to usher us through Shiro’s Greatest Hits, does not allow for very as many sensory details and anecdotal detours as some readers might prefer. It’s very much a broad strokes memoir which, much like the food celebrated within its pages and the modest man who penned each word, is elegant in its simplicity and wholly disinclined to win over its audience with any more frills or flair than it needs. What it does have are some of Shiro’s trade secrets, favorite recipes, and full page color photos that will give readers pause to regret not becoming sushi chefs themselves. For the reader who wants to know about knife care, making the best sushi rice, and what months local fish are in season, this is an excellent reference and guide. Shifting from one passion to another, Otaku Spaces (penned by Patrick W. Galbraith), is an informative exposé on Japan’s otaku culture, deftly navigated through a collection of interviews with men and women who are uniquely devoted to collecting things to an extent far beyond what society generally considers normal. The rooms of those interviewed are, if you’ll allow me this one cliché, packed to the gills with collectibles­—action figures and dolls, manga, anime DVDs, old computers, video games, black market paraphernalia, trading cards, and musical instruments, to name a few. One of this book’s great achievements is how it humanizes its subjects. People have the unfortunate tendency to pigeonhole one another into neat, stereotyped categories based on the things, groups, and ideologies someone else associates with. Having myself visited Akihabara, the first time ostensibly to complete a kind of fetish- and nerd-watching expedition, I recall expecting all otaku to be either socially hopeless Densha Otoko-style introverts, or perennially cosplaying extremists who stand out like the one jerkwad wearing street clothes at a Halloween party. This notion was borne by my Japanese friends’ attitudes and remarks whenever “otaku” came up in conversation, and how otaku are portrayed by the media. 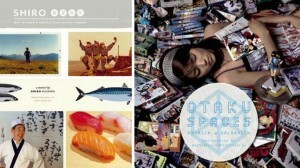 While making no attempt to glorify their lifestyle, Otaku Spaces does take deliberate strides to undoing the misconceptions that years of bad press and social opinion has created. For starters, the vast majority of the people featured in the book look and sound ordinary and well adjusted. The only difference, as far as I can tell, is that where they spend most of their paychecks on their hobby, while I spend the majority of mine paying bills. New York is damn expensive, I guess, is what I’m trying to say. Galbraith, currently pursuing a Ph.D. in cultural anthropology at Duke University and the author of The Otaku Encyclopedia, takes a more analytical approach to his work than Shiro, prefacing his interviews with the story of how “otaku” was coined, and why the term for so long carried connotations so strong that to be declared an otaku was akin to social excommunication. Predictably, there is some discussion about otaku culture and evolution over the years, how Akihabara grew into their Mecca, and how at last the things than many otaku love such as anime and manga have a fair amount of their own mainstream popularity (as I’m sure many of are already well aware of). As for the interviews themselves, one question—one straightforward little question—stands out in my mind: “Are you an otaku?” The payoff is an omakase assortment, a veritable rainbow roll of answers that, if nothing else, prove that these levelheaded individuals who know their passions swim defiantly upstream, and they feel no need or inclination to apologize or change. Nor should we expect them to. Visit Chin Music Press online at http://chinmusicpress.com.